As much as I personally rely on technology (and you can see from my blog posts that I absolutely do), I also sometimes long for the days of answering machines, CDs, and encyclopedias. Technology creates a demand for instant gratification: we must know the answers to our questions now, you must respond to my text or email now. We cannot just sit and wait idly by. I think back to middle school when I conducted research in the library, searching through book upon book, photocopying documents and even using the time-sucking microfiche, and wonder how our children would manage. For instance, if I tell my 1st grader son that I emailed a friend’s mom to set up a play date and I don’t hear back immediately, he will ask, did you text her? If he asks me an impossibly hard question to answer and I am unsure of the answer, he inevitably asks, can you look it up online? Is it a surprise he acts this way? When I watch a movie and an actor looks familiar but I cannot place him, I pause, read his IMDB profile, and continue the movie, content in my newfound knowledge. When I have a mundane question for a friend, I do wait until I see her next time; no, I immediately text her, expecting a response within minutes. If she cannot respond at that exact moment, I know I will receive a follow-up text explaining her delay (“Sorry, I didn’t see this earlier, we went to the movies). This is the world in which my children will grow up. My children have yet to really understand social media and I cherish these numbered days. My children do, however, understand the importance of technology in my life. If I happen to leave my phone somewhere lying around, my daughter will find it, grab it, and proudly run towards me to return it. It saddens me a bit to think that she thinks I really need it in my hand at all times. This year, my son drew a picture of our family in school. When I inquired about the blob next to my husband, he told me it was his computer. As a parent, I’m really a technology hypocrite. I get upset when my children barge into my bedroom without exchanges of “good mornings,” demanding television, kindles, and iPads but unbeknownst to them, I have already checked my email and Facebook before getting out of bed. Later in the day I tell them, “no more technology,” shutting off the TV and taking away the gadgets but moments later, I’m sending a text, watching a video, or composing an email. It’s a hard balancing act. When I use my phone or computer around my kids, I often try to explain what I am doing. “Mommy is paying bills. Mommy is writing to your teacher. Mommy needs to get back to this person right away. Mommy is writing.” I try to play when they play. They watch TV, I browse social media. But like I said, it’s hard. So, how did I do with today’s challenge? I still checked my phone too much, but I tried to do it discreetly. When I helped them to organize their toys, I left my phone upstairs for at least half an hour. When we went to the school picnic, I not only kept it in my bag, but I left my bag on the blanket for most of the evening. I don’t have a home phone so in many ways my phone is my lifeline. With three fingers I can count the people who call me on my phone regularly. I get good news, bad news, and everything in between texted to me. So ignoring my phone completely really can’t be a possibility. But, I really will make a conscious effort to put it down, put it away, and focus more on my kids when they need my full attention, which at this age is most of the time. It’s hard but I will try harder. And, that’s why folks, it’s a challenge. 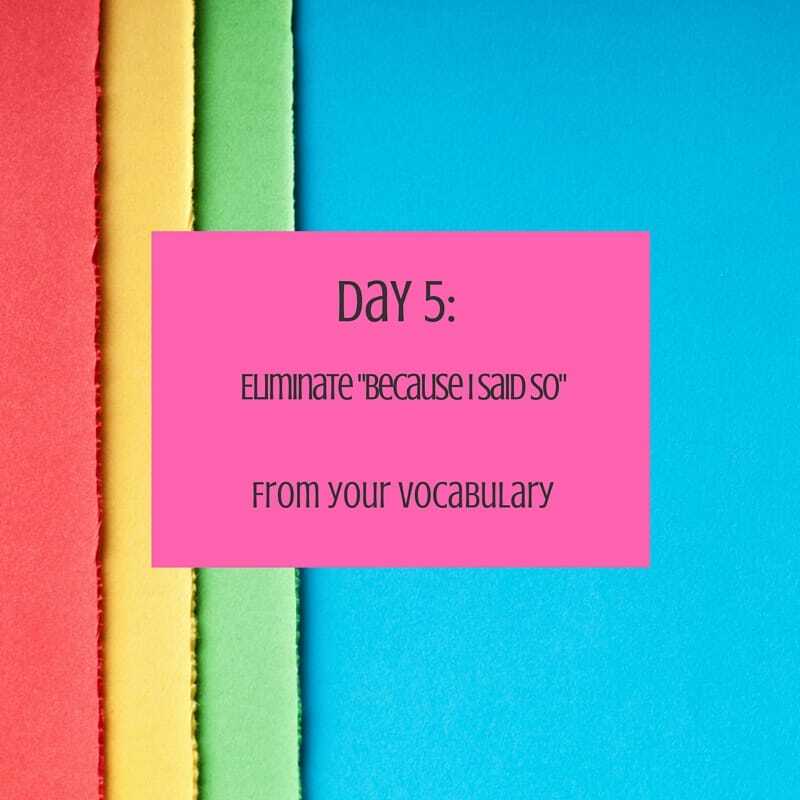 Now for tomorrow, Day 5’s challenge . . . I swore I never would say this expression but I do all the time. Maybe it’s something else for you. It’s the expression that makes you cringe as soon as it leaves your lips. That one. Let’s try not to say it. Let’s check back tomorrow. How’s it going for you? Remember, if you suggest a challenge and I use it, you will be entered to win a $25 gift card from Amazon. I really hope to hear your comments on this one. I thought this would be a short blog post but I guess I had a lot to say.